For all additional queries information or to make your booking, contact us. Visa, Mastercard, Eurocard and American Express credit cards are welcome. Ticket restaurants vouchers may be used at the restaurant. The hotel-restaurant does not accept cheques. Room rates are per day and are inclusive of VAT and service charges. Additional charge for tourist tax (€1.65 per person). A direct-dial telephone is available in each room and you will be required to pay a €1 charge to open the line. Breakfast is free for children under 6 years of age. Cancellation without any charges up to 24 hours before the date of arrival. For groups, bookings must be guaranteed by the payment of a deposit defined according to the total amount of the service which has been reserved. In the case of a cancellation, deposits will not be refunded or transferred to another stay. Rooms are available from 3 pm on the day of your arrival and up until 12 am on the day of your departure. PRM rooms available (please ask at reservation). Pets are not welcome at our hotel-restaurant. 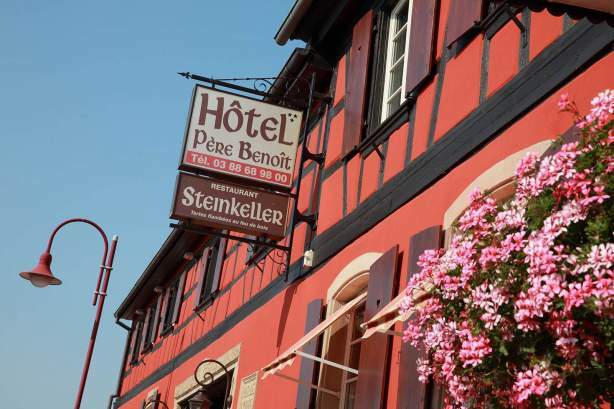 In case of problem and without any satisfactory answer from the Management of Hotel Père Benoît within 21 days, the customer may request the Mediator of Tourism and Travel (all details on www.mtv.travel).